I would like to take this opportunity introduce my business and myself to you. 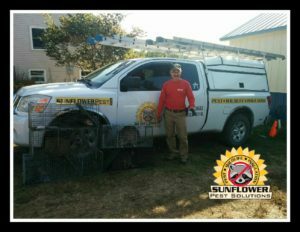 I am Tim Dinneen owner of Sunflower Pest Solutions Inc. I have 16 years experience in Professional Pest Management, and 21 years experience in Wildlife Control. I began my work in pest management by working for Overland Park Animal Control from 1994-1998. At this time I also volunteered with the Shawnee Fire Department as a Fire Fighter and EMT. I then worked for the Gardner Department of Public Safety where I had the shared duties of police officer, firefighter and EMT from 1998-2000. During this period I also had duties in wildlife management. I then moved to California and started a large wildlife control firm where I remained for the next three years before returning to Kansas in 2003 where I helped manage a large wildlife control firm. In 2005 I started Sunflower Pest Solutions Inc.
Sunflower Pest Solutions Inc. is a full service pest management company, and we handle general pest control issues such as ants, spiders (brown recluse), fleas, millipedes, silverfish, termite control, stinging insect control, rodent control, and wildlife control such as squirrels, raccoon, bats, snakes, birds, etc. We install Attic Insulation, remove contaminated insulation, and foam insulate rim joists in basements. We also offer green pest control solutions that limit the amount, type and placement of pesticides to target specific pests while keeping your family safe. We pride ourselves in providing fast response, effective service and full follow-ups to ensure that our job has been accomplished to your satisfaction. To maintaining the most progressive, safe, and detailed services possible. To listening fully and prepare diligently before, during and after service. Maintaining the highest level of professionalism with our customers, employees, and others in the field.